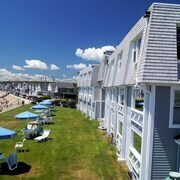 Located in the heart of Portsmouth, this hotel is 0.1 mi (0.1 km) from Market Square and 3 mi (4.9 km) from Kittery Outlets. Music Hall and Discover Portsmouth are also within 5 minutes. 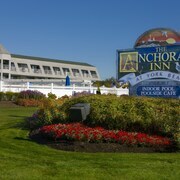 Located in the heart of Portsmouth, this hotel is 0.1 mi (0.1 km) from Market Square and 3 mi (4.8 km) from Kittery Outlets. Portsmouth Brewery and Moffatt-Ladd House are also within 5 minutes. 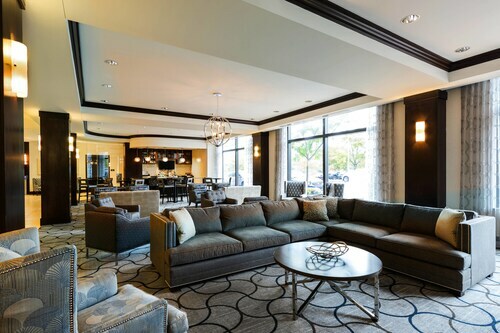 Situated on the banks of the Piscataqua River overlooking Portsmouth's working harbor and beyond, to the Maine coast, the hotel is two blocks from Market Square, the heart of historic Portsmouth. 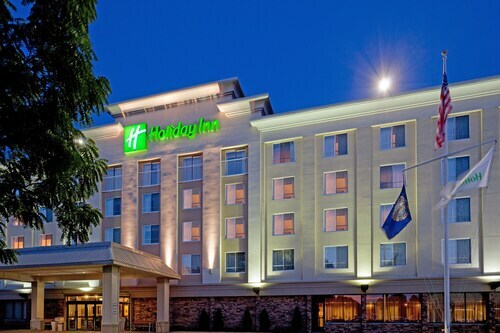 Situated in Portsmouth, this hotel is 0.7 mi (1.2 km) from Jackson House Museum and 3 mi (4.9 km) from Water Country. George Rodgers House and Discover Portsmouth are also within 1 mi (2 km). 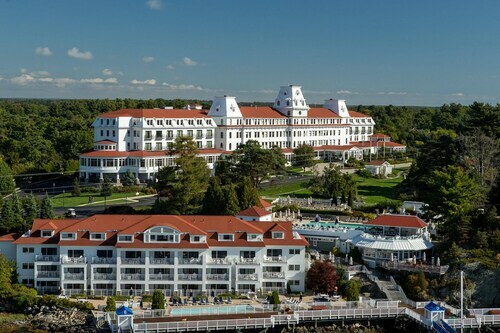 Situated on the waterfront, this spa hotel is within 1 mi (2 km) of Wentworth by the Sea Golf Club and Fort Stark State Historic Site. Portsmouth Harbor Lighthouse and Fort Constitution Historical Site are also within 2 mi (3 km). 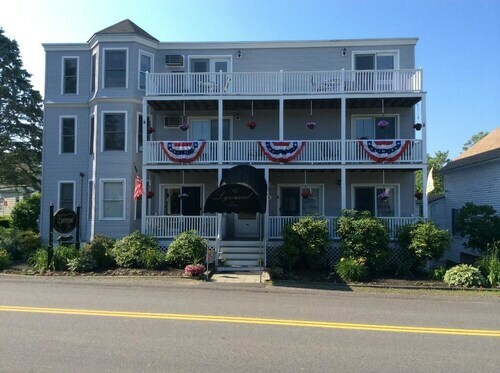 Located in the heart of Portsmouth, this hotel is 0.1 mi (0.2 km) from Market Square and 3.1 mi (4.9 km) from Kittery Outlets. Moffatt-Ladd House and Music Hall are also within 10 minutes. 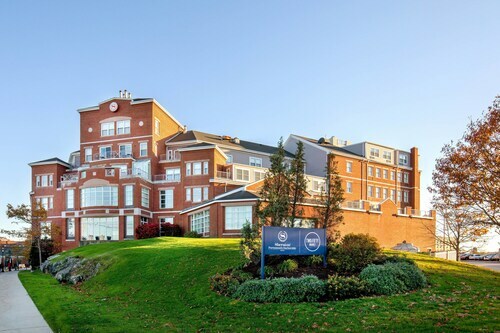 Situated near the airport, this hotel is within 3 mi (5 km) of Market Square, Music Hall, and Portsmouth Brewery. Strawbery Banke Museum and Kittery Outlets are also within 6 mi (10 km). 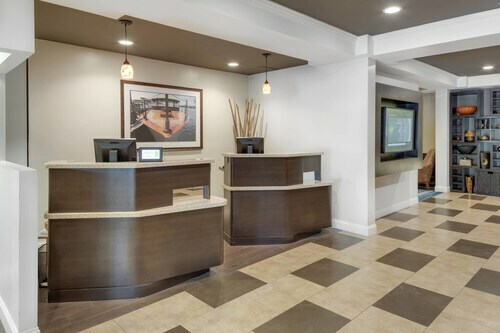 Situated in the business district, this aparthotel is within 2 mi (3 km) of Albacore Park, Fox Run Mall, and Jackson House Museum. George Rodgers House and Moffatt-Ladd House are also within 2 mi (3 km). The stylish Port Inn is within 2 miles of downtown Portsmouth, Pease International Tradeport, and Strawberry Banke Museum. Portsmouth Naval Shipyard is 3 miles away; the beach is 5 miles away. 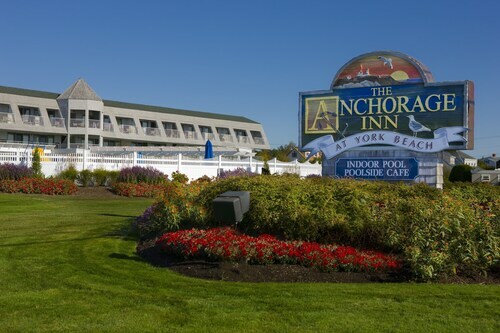 Nestled on the beach, this York hotel is within 2 mi (3 km) of Long Sands Beach, Short Sands Beach, and York's Wild Kingdom. York Harbor Beach and Wiggly Bridge and Steedman Woods are also within 3 mi (5 km). Situated in Portsmouth, this hotel is within 1 mi (2 km) of Jackson House Museum and George Rodgers House. Market Square and Discover Portsmouth are also within 2 mi (3 km). 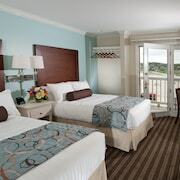 You can find 3 star hotels in York Beach that keep you close to all the great sightseeing and activities around the area, or even book a place that’s a bit more secluded, if that’s what you prefer. No matter what you’re looking for—whether you’re all about the location or are invested in on-site perks--Travelocity will help you find the accommodation that works best for you. When it comes to options, you’ll have them. 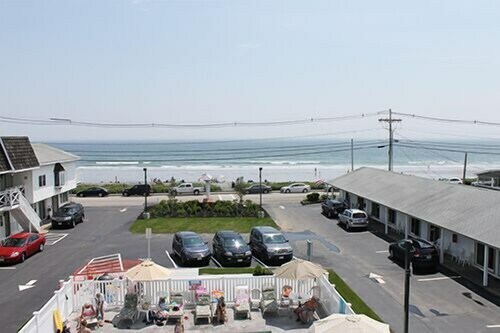 The York Beach 3 star hotels give you plenty of choices as far as access to the best areas, and many also offer a breakfast buffet, as well as plenty of other amenities like high-speed Wi-Fi and an on-site pool or spa. Whatever you’re looking for on your next getaway, browse Travelocity’s big selection of hotels to ensure you get the best possible deal. 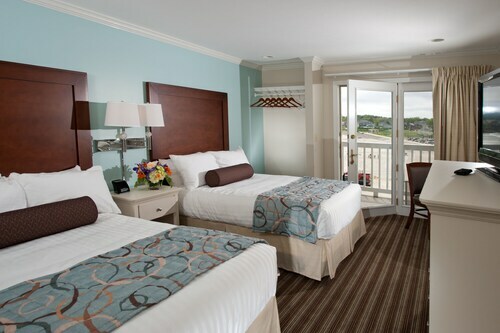 Book one of the best 3 star hotels in York Beach today! Hotel was great and the staff was very understanding when Travelocity booked the wrong room for us..we we're upgraded to an even nicer suite, wonderful staff and dining. Highly recommend! check in was a bit stressful. The man checking us in gave us a bit of a hard time because we had a service dog. I chose this hotel because the website said service dogs welcome and then he gave me a hard time saying I should have called a head to tell him. By law, this is not required but I did in fact try to call but got no answer and he proceeded to imply that I was lying. He also kept patting the dog despite the fact that he was explicitly told that she was working and not to be patted. Her vest also clearly states that no patting is allowed while wearing the vest. He was dismissive and abrasive. His brother, however, upon check out was lovely. Check-in was quick and easy. Woman working in office was pleasant and understanding. Room was clean and very quiet. We had a nice, relaxing stay. We stay here every year when we're in York, the rooms are a little dated but spacious and clean, and the location is pleasant and quiet. It's also a short walk to long or short sands beaches. We enjoy having a full kitchen and of course to sit on in the evening. The staff are very nice. This location has a lot going for it in terms of being a family-friendly and hospitable place. My stay at Sunrise Motel in York , Maine was overnight Saturday through Sunday June 16&17 2018. I was very pleased with my room. 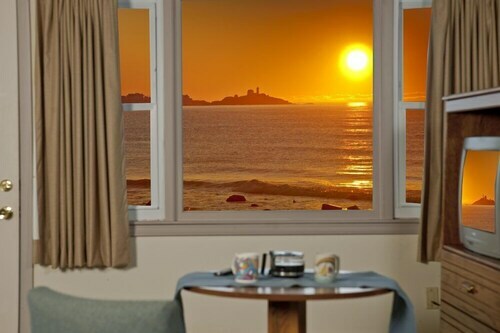 I was on the third floor in a room with an amazing ocean view. The bed was delightfully comfortable and I slept soundly right through the night. It was quiet , clean, and the shower was refreshing. I will stay there again. 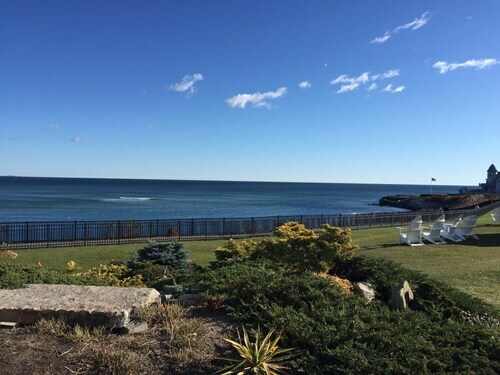 Enjoy Fantastic Water Views of the Atlantic and Nubble Lighthouse! NEW Listing! Oceanfront Home w/ Deck & Great View of Lighthouse & Ocean!